Congratulations to AIEA member Duleep Deosthale on receiving the 2016 EAIE President's Award. Congratulations to the following AIEA members on their election to NAFSA leadership: Elaine Meyer-Lee, Michael Adewumi, Erich Dietrich, and Anne D'Angelo. AIEA President-Elect Hilary Kahn spoke at Duke University. Her talk used Pacific Studies as her entry point and demonstrated the importance of rethinking binaries, particularly the dichotomy of global and area studies, and explored new ways to envision global studies and its impact. AIEA Members Cheryl Delk Le Good, David Di Maria, Jeet Joshee, Patricia Juza, George Kacenga, Daniela Locreille, Pia Wood, and Ian Wright all presented at the 2016 AIRC Conference. AIEA Members Joanna Regulska and Helen Gaudette presented workshop on Faculty and SIO Collaboration to Enhance Study Abroad Impact at the 2016 IIE Summit on Study Abroad. 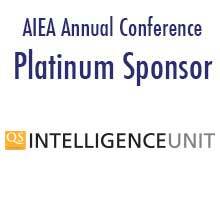 Congratulations to AIEA members William Archer, Melissa Banks, Brett Berquist, Gretchen Dobson, Elaine Meyer-Lee, and Douglas Proctor, who presented at the 2016 AIEC Conference. Fulbright-Hays Group Projects Abroad Short-Term Awards: St. John’s University, University of Pittsburgh, Hendrix College, Towson University, University of Texas at San Antonio, Xavier University, and Mississippi State University. Fulbright-Hays Group Projects Abroad Long-Term Awards: Cornell University, and University of Georgia. Fulbright-Hays Doctoral Dissertation Research Abroad: University of Arizona, University of California Berkeley, University of California Irvine, University of California Los Angeles, University of California-San Diego, Stanford University, University of Colorado-Boulder, Yale University, Georgetown University, Emory University, Northwestern University, Harvard University, John Hopkins University, University of Michigan, Michigan State University, University of North Carolina at Chapel Hill, Duke University, Columbia University, Cornell University, New York University, Case Western Reserve University, University of Virginia, and University of Wisconsin. Title VI Undergraduate International Studies and Foreign Language Award: University of Arkansas, University of Arizona, Colorado State University, University of Colorado, University of Iowa, Western Illinois University, Western Kentucky University, University of Central Missouri, Western Michigan University, Rutgers University, University of Pittsburgh, Wofford College, and University of St. Thomas.